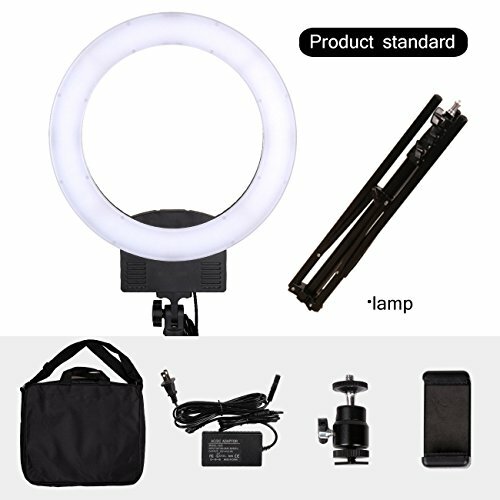 GSKAIWEN Series Ring Light with LED type and fluorescent lamp type, to take a close-up of the face,you can make beautiful eyes and also can be widely used for lighting, makeup with light,still life photography,characters photography,phone photography/video light. 30 DAY MONEY BACK GUARANTEE - All GSKAIWEN customers enjoy 30 Day Money Back Guarantee. Customers can return and get refunded in case the purchasing is not satisfactory for any reason. You have no risk to try and we will provide you the best service! 1.Adjustable from 3200K-5600K by yellow/white color separate dimmer control. 2.HIGH QUALITY - Big bang for the buck with this large, pro quality, powerful studio light - Built to Last and a fraction of the cost of traditional studio lighting. 4.WARRANTY: Includes 1 year manufacturer limited warranty and top rated customer support. 5.Ring light gives a very balance lighting effect on the face, removing the harsh shadows. If you have any questions about this product by GSKAIWEN, contact us by completing and submitting the form below. If you are looking for a specif part number, please include it with your message.